Umbria is the undiscovered Tuscany. 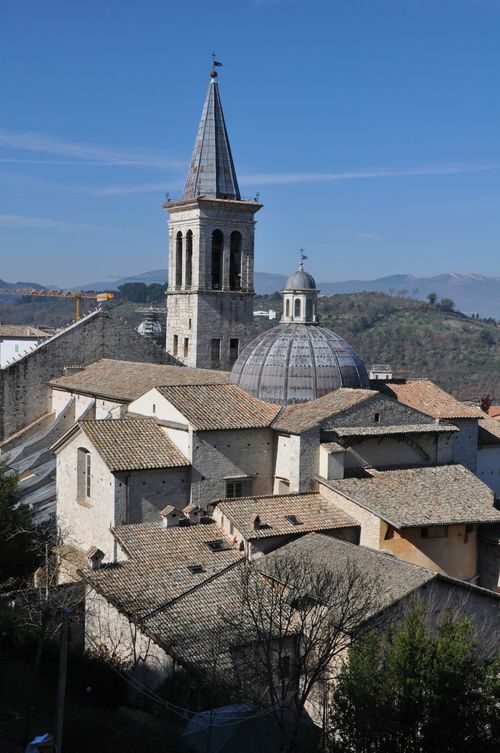 It has the rolling hills, medieval towns, excellent food, and artistic treasures of its next-door neighbor — but, thanks to the fact that Frances Mayes’ book was not “Under the Umbrian Sun” (although that does have more of a ring to it), tourists haven’t discovered it. Yet. One of Umbria’s loveliest towns is Spoleto. First settled in the 5th century B.C. by the Umbri tribes, who built the fortified walls that you can still see there today, the town isn’t just beautiful; it’s rich with history. Want to see ancient Roman remains? 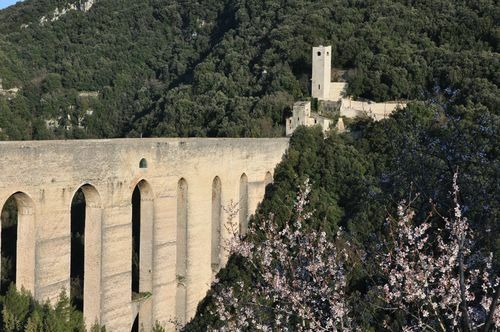 Spoleto boasts two ancient theatres and a bridge, the Ponte Sanguinario, so-called because of the killings of Christians that took place in the theatre next door. How about medieval sites? You couldn’t miss the imposing Rocca Albornoziana, a 14th-century castle, if you tried, nor the Ponte delle Torri — a striking 13th-century aqueduct that might have been built into ancient foundations (shown above). And that’s not to mention the surprising number of medieval churches for what feels like such a small town. Most notable among them is the Duomo of Santa Maria Assunto, completed in 1227. But the Duomo’s biggest claim to fame is actually Renaissance-era: the frescoes of Italian great Filippo Lippi (right), painted in the 1460s to commemorate scenes from the life of Virgin Mary. 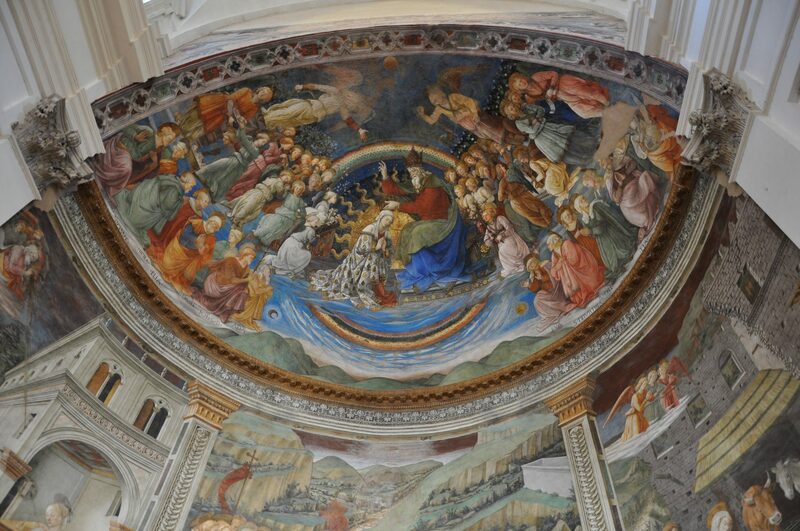 (Lippi is buried in the church, too). Finally: I think it’s worth noting that Spoleto boasts some particularly good dining, including one restaurant that a friend of mine likes so much he’ll drive to Spoleto just to eat there. It’s called Il Tempio del Gusto, located on Via Arco di Druso, 11. Information is available on the restaurant’s website. The easiest way to get to Spoleto is by train: it takes just 1.5 hours, and costs €7.45 for a second-class ticket, one way. Check for times and prices at www.trenitalia.it. If you’re lucky enough to have a car, Spoleto’s a 1.5- to 2-hour drive to the north. For a map, click here. For more information about Spoleto, click here. 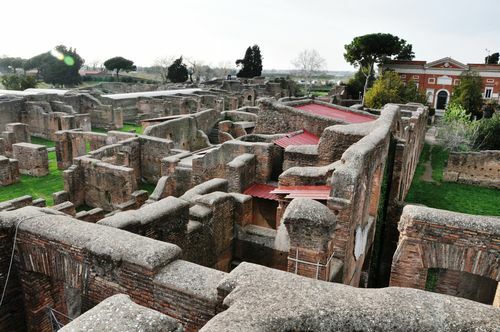 Ostia Antica, the ancient town just 20 miles from Rome, might not have the dramatic past of its Vesuvius-vanquished neighbors to the south. But if your interest is in getting a feel for the daily lives of the Romans, not the notoriety of a particular disaster, then head to Ostia Antica. of the remnants of houses, restaurants, and bars. There’s even a hotel. It’s still two stories tall — and you’re still allowed to climb the ancient stairs to the second floor. Like other high-quality ancient sites, if Ostia gives you one thing, it’s the sense of how little times have really changed. Not only could visitors to town stay in a hotel (with the more expensive, seaside-view rooms those on the higher floors), but they could walk across the street for a tipple at the bar and restaurant. 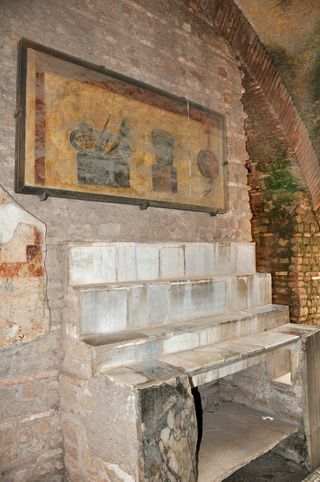 Here’s an image of that bar, left, complete with the marble shelving for various bottles and, above it, a fresco depicting exactly what the restaurant served — an ancient predecessor to the current menus with photos you see in Rome today. (Although, avoid those). And you can get a sense of ancient advertising. Take this shop, its floor a black-and-white mosaic of fish and seafood. What was this shop? The fish-monger, of course. 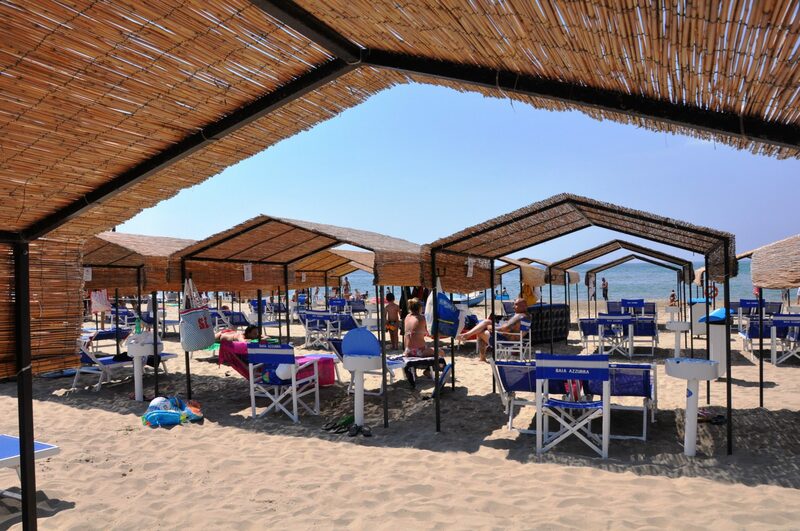 You can get to Ostia by taking the Metro, line B, to Piramide, then following the signs to the Roma-Lido station. From there, you can get the train to Ostia Antica, using the same metro ticket. For a map, click here. When the weather gets hot, the Romans go beaching. And those Romans with a little bit more time to spare… go to Sperlonga. Lazio's answer to Santorini, Sperlonga is lovely. It's also a little bit blink- (or walk too fast) and-you'll-miss-it: The town itself, at least the picturesque part that most tourists frequent, is pretty small. What's there, though, is scattered with lovely squares and winding alleyways. Ready to beach it? A 10-minute walk down a long set of stairs takes you to the beach, where, in typical Italian fashion, it's almost impossible to find the sliver that's public. Instead, make like the locals and pay for a cabana. At about €13 for a day's worth of a beach chair, roof to use once your flesh starts sizzling, and ability to have food and drinks brought to you, it's worth it. 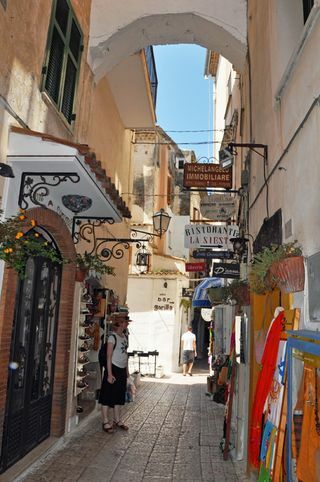 But modern-day Italians haven't been the only ones to frequent Sperlonga. The area's most famous vacationer? Tiberius, the second emperor of Rome. He liked it so much, he built a villa here. 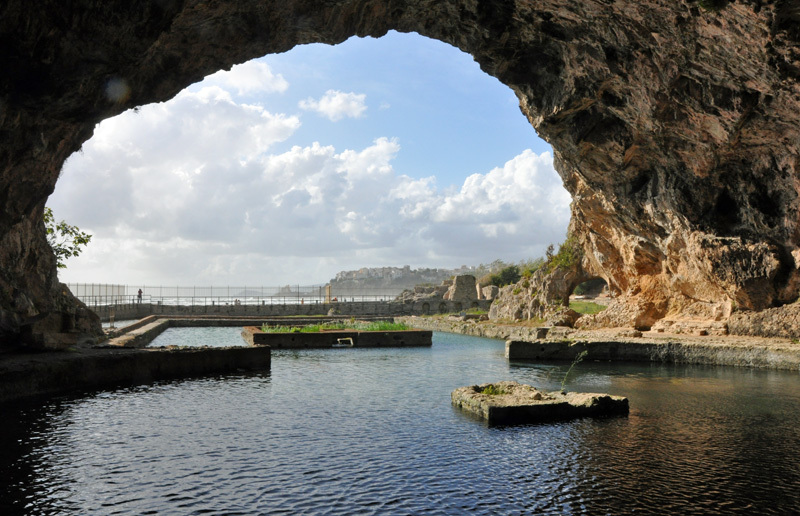 You can still visit the villa's "Grotto," a natural cave where the dining room was, at Sperlonga's archaeological museum (located about 3 miles away from the beach). And in the museum itself, don't miss the stunning, ancient sculptures done by Athanadoros, Hagesandros and Polydoros of Rhodes—the same guys behind the Vatican's famous Laocoön. If you're renting a car, Sperlonga is a 2.5-hour ride from Rome. (Traffic, though, can be a real problem, especially on summer weekends). 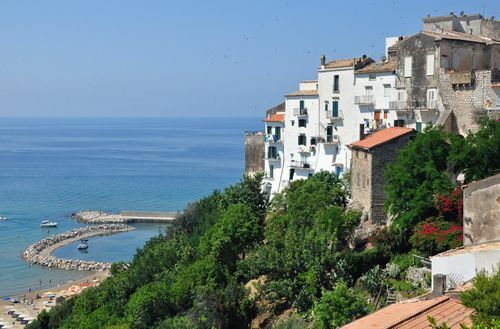 Alternatively, you can take the train to the Fondi-Sperlonga station, where local buses are coordinated with the train arrivals to take you to Sperlonga itself (there's a stop for the archaeological museum, too). The train takes a little over an hour, while the bus is about 15 minutes. A hassle? Slightly. 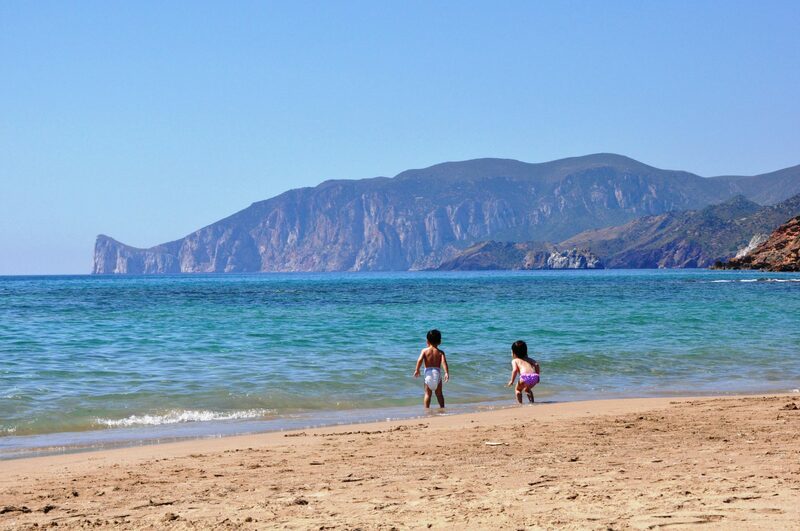 But Sperlonga is worth it. Also: the most idyllic island escapes from Rome, the city's best archaeological museum and a trip to the beach town of Monopoli, Puglia. 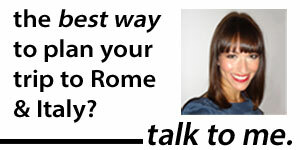 Want more local secrets on what to do in Rome? Check out The Revealed Rome Handbook: Tips and Tricks for Exploring the Eternal City, now available for purchase on Amazon, below, or through my site here! Destroyed (or preserved), like Pompeii, by the eruption of Mount Vesuvius in 79 A.D., Herculaneum shows you more than the shape of the ancient town. It shows you the town itself. The site boasts two-story buildings, colorful frescoes, and near-perfect mosaics. And because it was dumped mainly with a dense, volcanic stone called tuff, rather than the ash that felled Pompeiians, it’s only here, not at its more-famous neighbor, that you can see remnants of actual wood. There’s nothing like seeing an ancient bedframe to feel uncomfortably close to the townspeople who died here nearly two millennia ago. 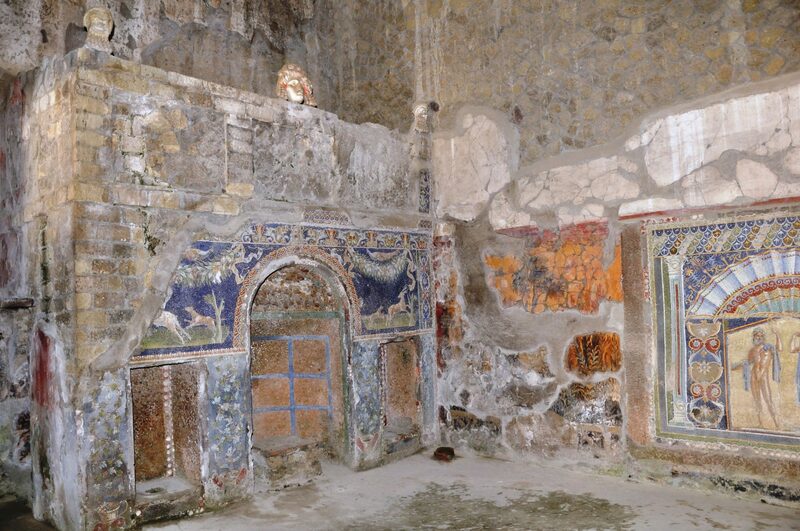 Even so, Herculaneum hasn’t managed to usurp the hold that Pompeii has in the international imagination. Why? It’s a lot smaller, for a start: about a third of the size. It’s also somewhat less grand. But with better-preserved buildings, less crowds, and a closer location to Rome, it’s also a rewarding alternative to its more-notorious neighbor. And don’t underestimate the site: It takes the thorough visitor a good three hours to peek into each house’s nook and cranny. Last week, a friend of mine visited me in Rome. He'd never been to Italy before, and he asked if we could day-trip to Venice. I hedged. Venice is expensive, and touristy, and crowded, I told him. But I knew I had to come up with an equally-seductive alternative. Racking my brain — and asking everyone I knew — I finally came up with an answer: Sardinia. A week later, we were on the plane. (If a Ryanair counts as a plane: Ryanair's rickety machines always strike me as much as planes as, when I was 4, a big cardboard box was an actual choo-choo train. It takes imagination. And faith.) We landed in Cagliari just an hour later. And from there, hopped on a train to Iglesias. Even for the directionally-challenged and even without renting a car — something we'd expressly been told NOT TO DO by most Italians — getting from City A to City B was a breeze. And oh, were we glad we went. Sardinia gets packed in July and August, but in early June, we were the only tourists — including Europeans — that we saw. And since most Italians beeline for the northern Costa Smeralda, I'm not sure if the west coast's Iglesias, where we stayed, ever gets crowded. Take our bed & breakfast, "La Babbajola": Since we were the only guests there, for just €60/night, we had the whole palazzo — complete with clawed bathtubs, frescoed dining room, and antique armoires — to ourselves. Let's just say it felt more "baronial" than "B&B." I hail from the cold (in all sense of the word) clime of New England, but my friend's from friendly Alabama — and he agreed. From the woman who came up to us in the street and greeted us so warmly, with kisses on both cheek, that we thought it was our B&B owner (it wasn't), to the cosmetics-store clerk who took pity on our unwashed selves and gave us loads of free samples of moisturizers and perfumes (were we that smelly? ), everyone was so darn nice. And they didn't expect a thing for it. Living in Rome, I'd forgotten what that was like. 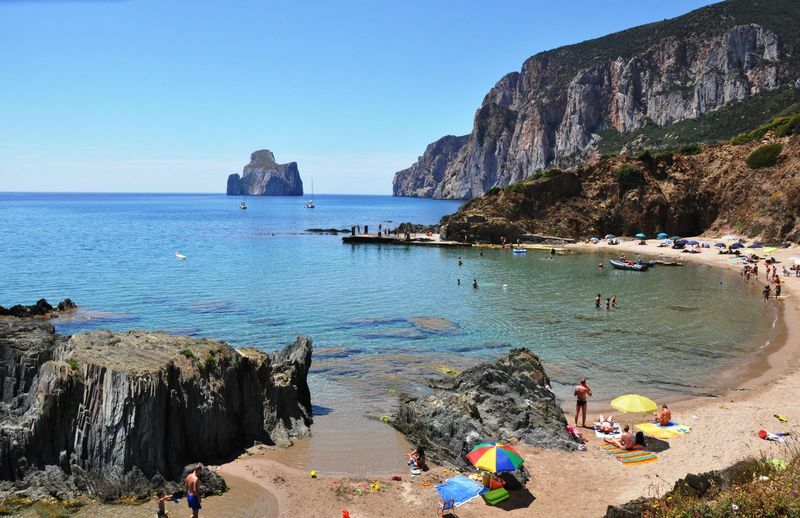 If you go to the less-frequented side of Sardinia, including its western coast, be aware that very few people speak English. The town centers can be incredibly confusing, and public transport is slim to none. But I, for one, am going back.